Affectionately known for many years as either the "Rossmore Flyer" or latterly the "Monkeys Hump and Heavenly Bottom Express", this route linked the Upper Parkstone shops along Ashley Road with the district known as Rossmore, passing on the way through the locations mentioned in its nicknames. All these places being in the town of Poole in the county of Dorset. This is a route I have known as man and boy, as passenger and driver. Over the years, it was my good fortune to be involved in the management of this service on two different occasions. I worked with three of the four independent companies that took over the operation of the service after the original founder, Miss Foott the racehorse trainer, retired from the business with advancing years. 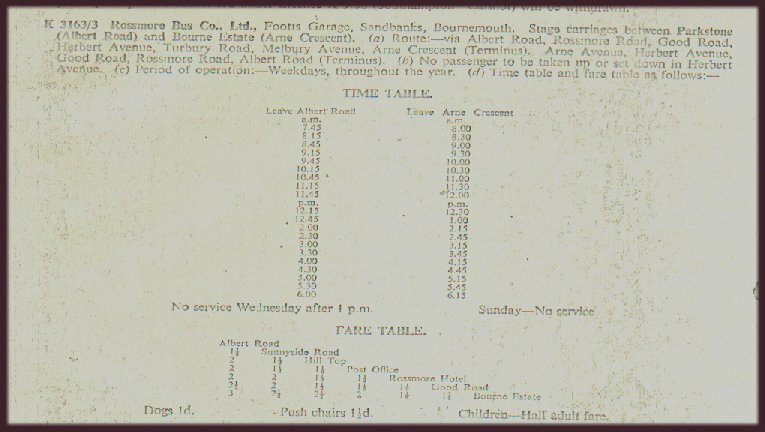 The story of the Rossmore Bus Service starts back in the 1920s when one of Poole's great characters came to live at nearby Sandbanks after serving as a driver-mechanic in the First World War. Louisa Foott (later to become Mrs Louie Dingwall after marrying Archibald) arrived in town with a Ford Model T presented to her by the Canadian army. She became one of the first women in the country to obtain a PSV drivers licence. The Model T and other similar vehicles were used initially on services from Sandbanks - where she both lived and trained race horses - to Poole and County Gates. She had a garage and petrol station in Panorama Road, Sandbanks (where she met Lawrence of Arabia in 1935 when his Brough motor cycle broke down - she ran him and his motor cycle to his home at Clouds Hill near Bovington Camp in her van, a distance of about fifteen miles). These early vehicles were named Henry I, Henry II, through to Henry VIII, and then the names continued with the wives of that merry monarch. Another operator on these routes for a while at this time was Herbert Rendell of Parkstone, who withdrew in 1929 to concentrate on his Cosy Coaches business (which firm figures in this story again in later years). But the principal strong competition on the Sandbanks routes was from Hants & Dorset (subsequently Wilts & Dorset. nowadays MoreBus), and eventually an agreement was reached with them in 1929 whereby Louie withdrew and concentrated on the Rossmore route she had started a few years previously. This route was first licenced to Miss Foott by the Poole Borough Council in 1925/26. A hilly busy route of less than one and a half miles in length started near the shops in Upper Parkstone ("up on hill"), and ran down along Albert Road through "Heavenly Bottom" and then up another very steep hill to "Monkeys Hump", before turning left to run along Rossmore Road, to terminate at the Gospel Hall. After some years it was extended in late 1933 to the corner of Brixey Road and eventually in 1949 it went a short distance further along Rossmore Road into the then new council housing development at Trinidad Estate. A route length of one and three quarter miles was thus attained. For a few years from 1949 on until the mid 1950s three buses were scheduled all day on this busy route to maintain a ten minute frequency. A far cry from the early years when the route had ended in gorse heathlands near a gypsy camp along Rossmore Road, before many of the houses were built - but Louie saw the future potential and was proved right. Largely forgotten is the 1930 plan to extend Miss Foott's route south across Ashley Road along Madeira Road, Alexandra Road and Vale Road to the latter's junction with Bournemouth Road, and then Archway Road to Penn Hill Corner and further on to the seafront at Branksome Chine. If this had happened the route would have been more than twice as long, but nothing was to come of this, presumably because of objections from Hants & Dorset who had just made the agreement about the Rossmore service. Even a more modest and apparently innocuous route extension just to Vale Road - that would have linked a few more residential roads to the shops - was seemingly refused. Perhaps because the terminus there would have been only 200 yards walk from Sharp Jones Pottery at Branksome, then a major employer in the area - or perhaps not . . . The Rossmore route became the only independently operated town service in the Borough of Poole, with all other routes being run by Hants & Dorset. A great selection of characters were involved over the years. There was Louie herself, still training race horses (a predominantly male occupation by long tradition) at Sandbanks well into her 80s. Peter Archer, whose father drove the Rossmore Bus in wartime years, recalls that two of the horses were called 'Pink Stripes' and 'Pinky's Sister'. Louie would often pop up to Parkstone unexpectedly in her horse-box to check on the buses and drivers. A long standing driver for many post-war years was Eric, a Polish ex-serviceman. Peter Holmes remembers working as a trainee fitter for a while in the fifties, servicing the "Rossmore Flyers" from an often flooded pit in Kitchers Coal Yard off Rossmore Road. And as a schoolboy I had many pleasant rides on Saturday mornings in the mid-fifties, unofficially helping the driver of utility-bodied Bedford OWB BFX32 to issue tickets from the then new Ultimate machines whilst working busy 'shorts' to and from the Rossmore Hotel! BFX32 was new to Sheasby of Corfe Castle in 1943, and soon passed to Bere Regis & District in 1944. Acquired by Rossmore in November 1954, and after three years use was sold locally to Rogers Transport (haulage contractors) in September 1957 and broken for spares. One of my all-time favourite buses! The business was incorporated as the Rossmore Bus Company Ltd on 10th December 1946. In the late 1940s and early 1950s, thoughts of expansion were in the air. In August 1947 an application was made for a circular service, to be worked in both directions alternately by one vehicle, down Albert Road, along Sunnyside Road and back up Churchill Road to the Upper Parkstone shops. It is unclear whether this actually ran or not but if so nothing much seems to have come of this; Churchill Road eventually got a bus, but only for a few years from 1952 to 1954, and then only five or six times a day. It started from Jubilee Road by the side of the Regal Cinema and the Ashley Road shops, and went down hilly Churchill Road and Victoria Crescent to the bottom of Southill Road - a point in Heavenly Bottom about a quarter mile west of the main route running along the parallel Albert Road. I remember a hand painted sign in Jubilee Road with a list of the departure times and recall being told by one of the drivers that the extra route was resourced by pinching a bus off the main route for ten minutes or so to provide a quick run down and back up again on the Churchill Road service. In 1953 buses left Jubilee Road at 8.15, 9.10, 10.25 and 11.55am, 2.05 and 5.00pm weekdays only; returning from Southill Road five minutes later. No service after 12 noon on Wednesdays (half day closing for the shops in Upper Parkstone; the main Rossmore route was also reduced in frequency on Wednesday afternoons). 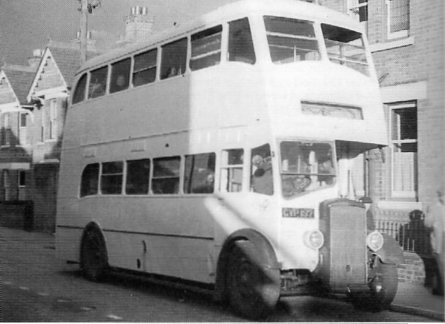 Daimler / Metro Cammell CVP187 was the first of four ex-Birmingham double deckers acquired in 1951 and 1953. The others were CVP197, CVP200 and CVP208. All were new to Birmingham Corporation Transport in 1937. These deckers were to be the mainstay of the Rossmore route until about 1956/57, until a subsequent reversion to one man operated single deckers. The pictures shows three of them in the early 1950s. CVP197 is the odd one out as it had been rebodied by Birmingham in 1949 with an English Electric body acquired from Manchester and was to last with Rossmore until broken up in 1959. Sister vehicle CVP207 is preserved at the Birmingham and Midland Motor Omnibus Trust's museum at Wythall in the north of Worcestershire. But more importantly in 1954, plans were made to introduce an additional route to serve the new council housing development at Bourne Estate, about a half mile north of the existing route along Rossmore Road. 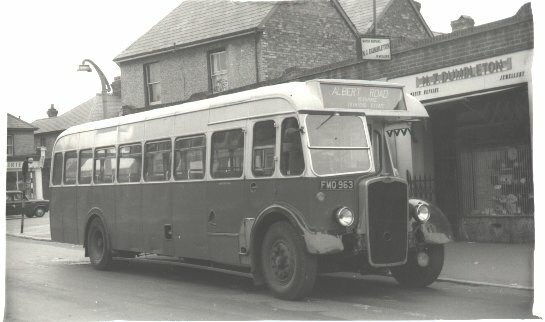 Whilst the Churchill Road route was often served by pinching a bus off the main Rossmore route for twenty minutes, the proposed service to Bourne Estate would have its own bus allocated to run a basic half hour frequency. Hants & Dorset also saw good reason to link the Upper Parkstone shops to the new Bourne Estate, and proposed a new route 23A. This would start in Bournemouth Square, run almost the full length of Ashley Road through Parkstone, and then proceed along Cranbrook Road and Brixey Road towards Bourne Estate. So both operators would link the Parkstone shops to the new housing, but by substantially different routes. Coincidentally the plan for a new route to Bourne Estate came at the same time as the withdrawal of the Churchill Road runs - with hindsight one wonders why the Bourne Estate route might not have served Churchill Road instead of, as proposed in the application, duplicating two thirds of the length of the main route along Albert and Rossmore Roads. The competing applications went to traffic court to be heard by the Traffic Commissioners in the autumn of 1954. And in the end, neither service started - reportedly because of the poor condition of one of the roads which both services needed to use to reach Bourne Estate (Good Road - only about a quarter of a mile long but with two right angled corners in its short length). 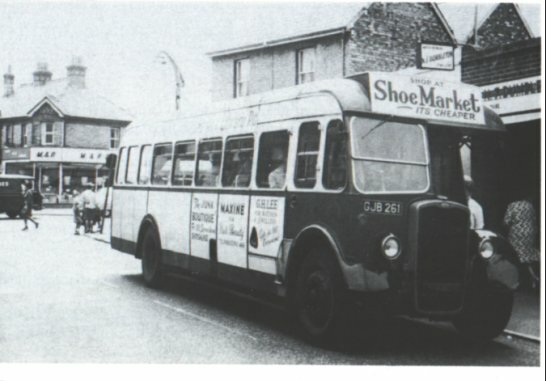 Although Bourne Estate had Hants & Dorset services to both Bournemouth and Poole town centres by this time, it was to be over thirty years later with deregulation in the 1980s that a regular bus service eventually ran from there directly to the Upper Parkstone shops. One cannot help but wonder if the simplest expedient might not have been for the borough council to have improved the short stretch of road in question ..... or was that reason put forward simply as a face saver so that both the competing companies could withdraw their respective applications? 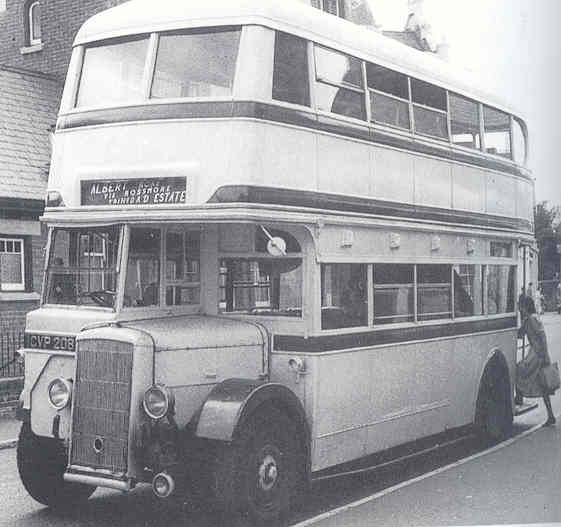 Whilst in pre-war years some vehicles had been purchased new, the double deckers of the early 1950s were replaced by a series of second-hand single deckers from various parts of the country. Two ex-Yorkshire Traction TS7Cs registered HL7519 and HL9070 (B35F) were followed in turn by ex-Lancashire United 166 TS8 DTF267 (B32F) and FEH815 (B35F, ex-PMT). By late 1961 these were replaced by WS4516 (AEC Regal/Alexander B35F ex-SMT) and CAG806, another Regal but with Burlingham B35F half canopy, ex-WSMT 578. This pair operated until 1965. 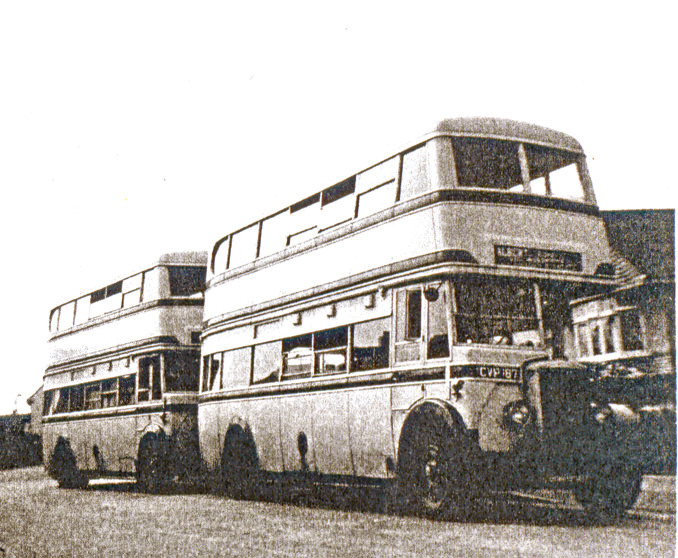 There were two Leyland TS8/Roe - CTF429 (B34F) and CTF433 (B32F) as the 50s turned into the 60s. Also there was DRN347 Sentinel STC6 (ex-Ribble 290) which was used for under a year, and DRN351 (ex-Ribble 294), both having Sentinel B44F bodies. Others followed but a stalwart of the 1970s through and beyond the Cosy Coaches takeover was Bristol LL6/ECW JRU66 (FB39F), which I remember driving - with some difficulty because of the awkward crash gearbox - on several occasions on busy summer Saturdays. 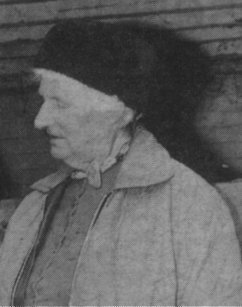 Louie ran the Rossmore Flyer for over 40 years until she was over eighty years of age, and then in the early months of 1973 sold the still thriving business (which had become a limited company in 1947) to Cosy Coaches of Parkstone, then owned by Simon Rendell, the son of the Cosy founder Herbert. That the route was still good business is evidenced by the sale price of £20,000. 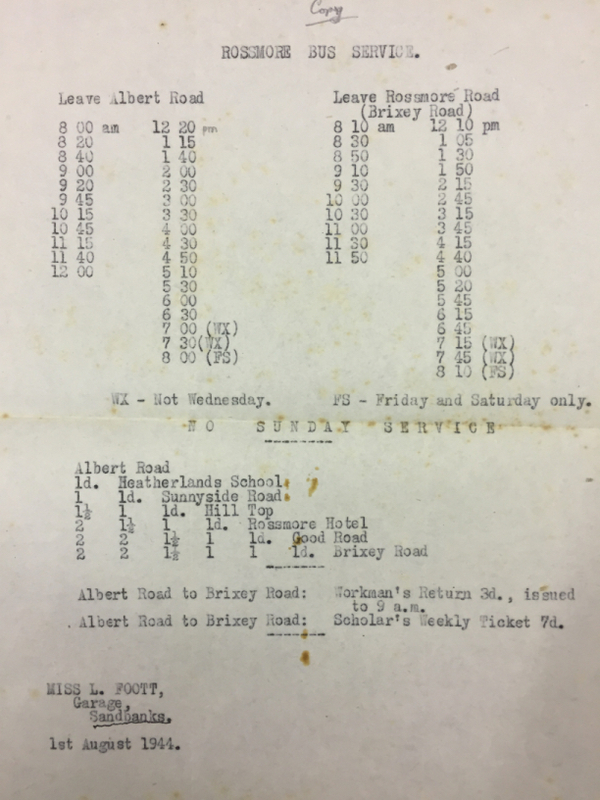 An old waybill from April 1975 shows that each of the two all day buses was averaging 700 passengers and £40 in takings a day. The Sunday service had been withdrawn in 1971. 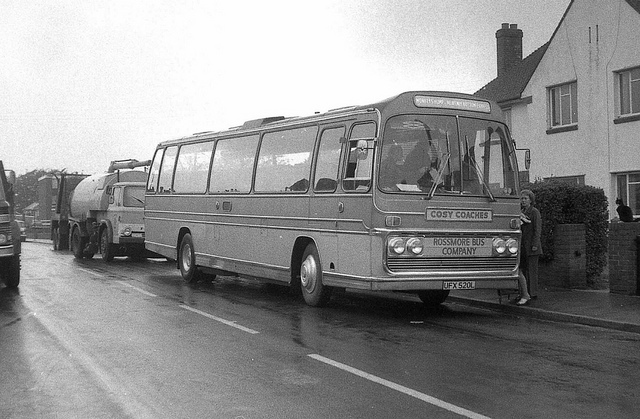 Although Cosy's twenty plus fleet of coaches was primarily involved in private hire and foreign language student work, the bus route was not neglected and there were again plans made to extend the route, this time to the Alderney East and Alderney West housing estates. But nothing came of these proposals, which would have needed a three bus operation on a 15 minute headway (and a two hourly frequency on Sundays). At this time the main route was on a 15 minute frequency with two vehicles covered by three shifts. 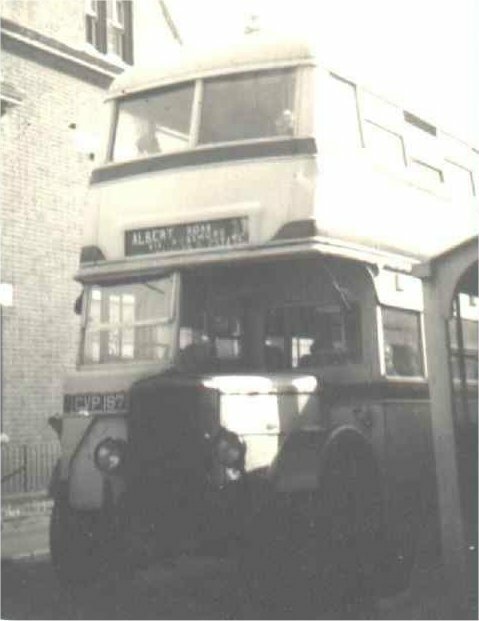 In a shrewd piece of marketing Cosy Coaches displayed the name "Monkeys Hump and Heavenly Bottom Express" on the headsign of UFX520L, one of the two grant assisted 53-seater Bedfords working the service (the other was UFX521L). The regular drivers covering the two buses in service at this time on a three shift pattern were Robby Martin, Dave Shear and Reg Davis. After three years of Cosy operation the frequency was reduced in 1976 to a one bus shuttle on a 20 minute frequency. This was usually RPR747K, a Bedford YRQ/Plaxton 45 seater coach, driven by Brian Baverstock, relieved by John Dennis. Cosy Coaches continued on the Rossmore route for ten years and the service then passed to the Stanbridge and Crichel company in December 1983 (following financial difficulties at Cosy and the subsequent demise of the business). The story continues in Rossmore Bus - the later years. 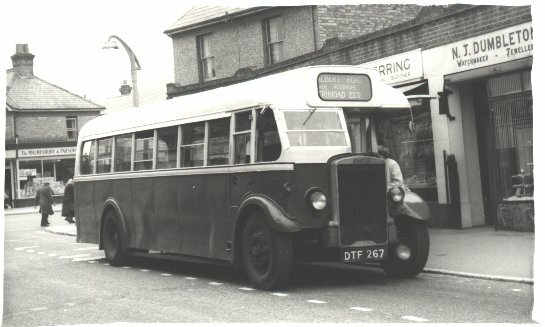 Still at the Albert Road terminus, but viewed from the other side of the road, DTF267 (Leyland TS8, ex Lancashire United) loading passengers. It was sold on in 1961. And here in turn is "Eric's Bus" in the 1960s - FMO963 awaits departure time. This was a 1951 Bristol LWL6B bought from Thames Valley in 1962. Sister vehicle FMO967 came to Rossmore too the following year 1963. GJB261 looks more like a mobile advertising hoarding than a bus ............. in the fleet from 1964 to 1971, as was sister vehicle GJB252. Again these two vehicles had come from Thames Valley. CHD606 (hailing from Essex) and KEL122 (ex Bournemouth Corporation). With the route now being operated by Cosy Coaches, the mid-1970s find UFX520L - one of two government grant assisted 53-seater Bedfords working the service (the other was UFX521L) - at the Trinidad Estate terminus. 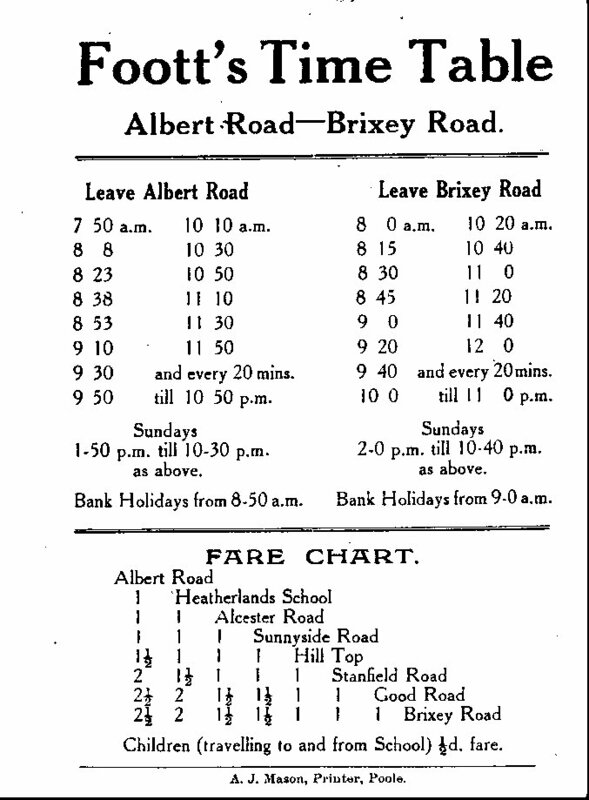 This is an early timetable from late 1933 when the route only ran along Rossmore Road as far as the corner with Brixey Road. This predates the extension of route further west along Rossmore Road to the then as yet unbuilt Trinidad Estate. It seems only one bus is needed to run the route, but it's a very hectic schedule between 8 and 9 o'clock in the morning. End to end fare two and a half old pence (about one new penny). A recently discovered wartime timetable dating from August 1944. Outside of peak time wartime economy meant a half hourly service that could be operated by one vehicle, and on Sundays no service at all. 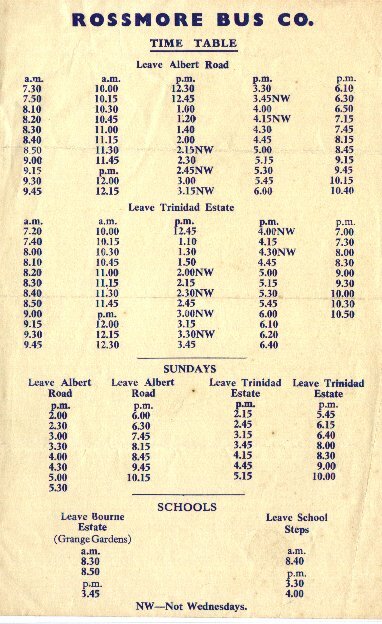 The October 1949 timetable, requiring three vehicles in service from 8.00am to 5.30pm to maintain the ten minute headway. The double-deckers of the 1950s had yet to be acquired. A reduced frequency on Wednesday afternoon (half day closing for the Upper Parkstone shops). What was (or might have been?) - the 1947 proposal for a Sunnyside Road circular service. Memory is unclear as to whether this ever operated or not, but it was one of a series of attempts to provide a service along Churchill Road in one way or another. This is a copy of the application from the Notices and Proceedings of the South Eastern Traffic Area. What might have been? 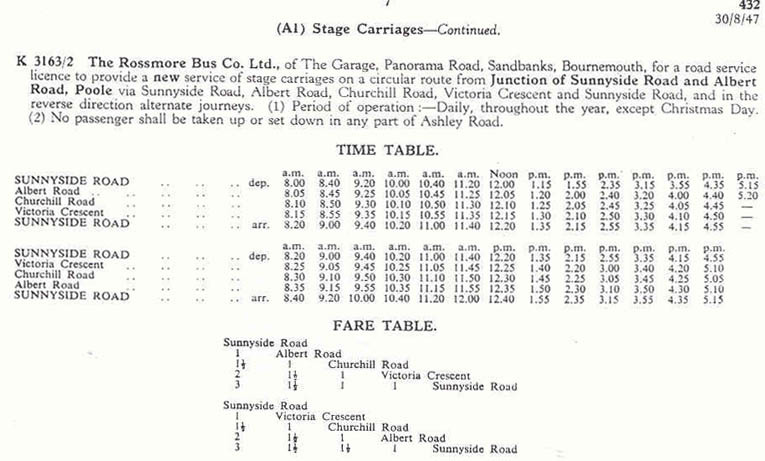 The timetable for the proposed Bourne Estate route in 1954, which was never introduced. This is a copy of the application from the Notices and Proceedings of the South Eastern Traffic Area. One bus would have been sufficient to maintain the service at the half hourly frequency. Three quarters of an hour allowed from 1.15 pm for a lunch break for the driver. And a last shot of one of the Rossmore double deckers (CVP208) that might have run the new route to Bourne Estate ...... if only! In the fleet from 1953 to 1956. As a young schoolboy I spent many hours in the early and mid-1950s hanging around at this location watching the buses, even riding on them when I had a spare copper or two to spend. Looking back 60 years it is sometimes difficult to recall just how busy this route was in those days, needing double-deck operation at ten or fifteen minute headways. In 2013 one bus an hour was the offering.